You'll be £4.99 closer to your next £10.00 credit when you purchase London at War. What's this? The two world wars of the twentieth century seem so distant from us now, a lifetime ago, in a different age. Yet in London the evidence of these conflicts is around us, near at hand, in the many relics and reminders that are scattered across the fabric of the modern city. And, as Alan Brooks demonstrates in this fascinating photographic record, they can be seen and visited today. Plaques and inscriptions, graves, cemeteries and rolls of honour, stone monuments and stained glass, war-damaged buildings, pillboxes and air-raid shelters, painted signs and camouflage – these are just some of the mementoes of war, and of the experience of Londoners, during the greatest conflicts the country has known. This book is aimed at those with an interest in the subject who have easy access to the areas covered. The author has produced a valuable source of material and saved his readers much searching, both on the ground and in records. The two world wars of the twentieth century seem so distant from us now, a lifetime ago, in a different age. Yet in London the evidence of these conflicts is around us, near at hand, in the many relics and reminders that are scattered across the fabric of the modern city. And, as Alan Brooks demonstrates in this fascinating photographic record, they can be seen and visited today. The two world wars of the 20th century may seem, for some, an age ago – a lifetime. But take a look at this book and you will see that in London, there is still evidence of the conflicts all around, being a photographic record of London's memorials and monuments. 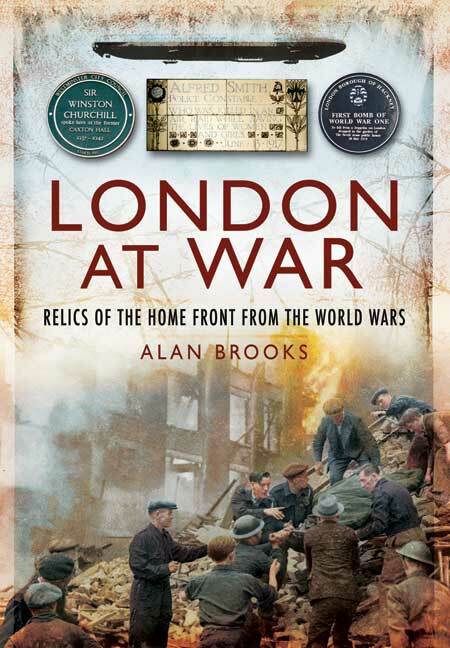 Alan Brooks, a retired radiologist, has lived in London for most of his life and has long been fascinated by its history, particularly relating to the two world wars. The nearly 300 photographs he has taken to produce this book represent years of research into the impact of war on the city and the traces it has left.